Gary Haynes is a fifth generation Michigan farmer with fields in three counties, including Eaton County, which is considering whether solar panels will be allowed on farmland. My family has farmed for five generations in mid-Michigan. Today I grow corn, wheat and soybeans in Eaton, Ingham and Jackson Counties. Like anyone in agriculture, I believe farmland should be preserved for the future and that we should do all we can to protect our air, land and water for future generations. In addition, we should seek opportunities to bring new jobs and new investment to rural communities throughout Michigan. Solar energy is one way to fulfill all of those goals. 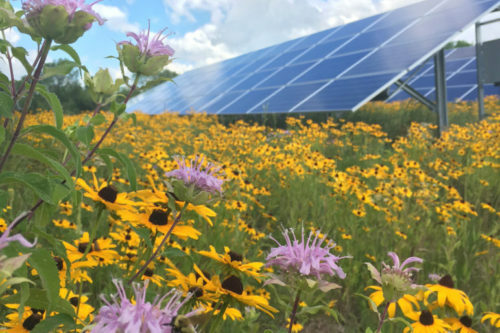 Right now, Eaton County is considering whether solar panels will be allowed on farmland in the county, and for multiple reasons, this is simply the right thing to do. First, solar energy and farmland preservation go hand in hand. Click here to continue reading. A new report by the Consumer Energy Alliance (CEA) examines solar power incentive programs in 25 states. The report considers five categories of “direct” incentives: federal tax incentives, state tax credits, state rebates, utility programs (such as net metering), and Renewable Energy Certificates (RECs). Amazingly, in eight states (Massachusetts, California, New Jersey, Rhode Island, Connecticut, Arizona, New Hampshire, and Minnesota), incentives exceed 100 percent of the costs of installing solar PV systems. Updated: New US Solar Record — 2.155 Cents Per kWh! (with Escalator for Inflation), CleanTechnica. Notably, not even 5 years ago, 2–3¢/kWh solar was projected for 2050. Nevada Power is owned by Berkshire Hathaway, a Warren Buffet company. Consumers Energy announced Wednesday that it will soon file a long-term plan with Michigan regulators that calls for shuttering the Karn coal-fired power plant in 2023, eliminating coal use and more than tripling renewable energy utilization in just over a decade. This entry was posted in Incentives, NewsBlog and tagged corporations' renewable energy goals, farmers benefitting from renewable energy, Massachusetts Senate's Clean Energy Bill, MREA's annual energy fair, Nebraskans for Solar NewsBlog, renewable energy news, schools and colleges powered by solar energy, solar incentives on June 17, 2018 by Helen Deffenbacher.